Credit: Design: © Flore Maquin / Photo: Pierrot le Fou © Georges Pierre. 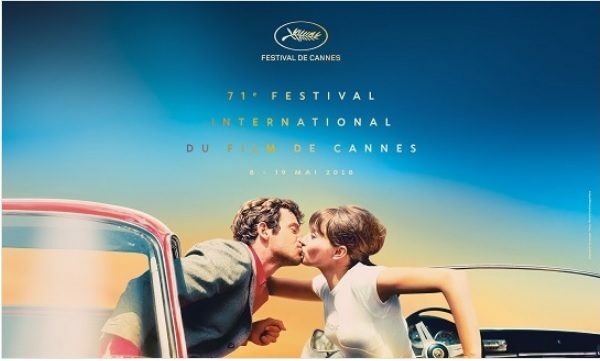 The poster of the 71st Cannes Film Festival, taken from Jean-Luc Godard’s Pierrot le fou (1965), is inspired by the work of Georges Pierre (1927-2003). This immense still photographer immortalised the shooting of over a hundred films in a 30-year career that began in 1960 with Jacques Rivette, Alain Resnais and Louis Malle. He then worked in partnership with Robert Enrico, Yves Robert, Claude Sautet, Bertrand Tavernier, Andrzej ?u?awski, Andrzej Wajda, and Jean-Luc Godard. The poster itself is the work of graphic designer Flore Maquin. Inspired by pop culture, this 27-year-old illustrator blends drawing, painting and digital art in a vibrant and colourful world. A passionate film buff, she works with Universal Pictures, Paramount Channel, Europacorp, Wild Side, and Arte, revisiting or creating alternatives for film posters. This year’s Cannes Film Festival runs from May 8-19, opening with the world premiere of Asghar Farhadi’s Everybody Knows, starring Javier Bardem and Penelope Cruz. The festival will also see the premiere of the highly anticipated Solo: A Star Wars Story.